The most luxe hair serum I have ever had the pleasure of trying, this gorgeous Repairing hair serum (£24 for 30 ml) from Kae includes Argan oil, Monoi de Tahiti, olive and coconut oils. As you would expect from the ingredients list this really packs a punch in the hydration stakes and will probably be too heavy for fine hair, however if you have dry, frizzy or damaged hair this serum is a real treat. I also think it is perfect for the summer when hair needs a little looking after when it is exposed to sun and sea. I apply a drop or two to the ends of my hair wet or dry and smooth over any frizz with what’s left, the serum is a total pleasure to use and is beautifully scented with rosewood and Ylang Ylang, which makes it a wonderful treat for the senses too. I found this really helped me with damaged hair and since using it my hair has become smoother and more manageable. A light hand is key when it comes to application, you can always add more serum but you can’t take it away. Unlike other argan oil serums, this isn’t loaded with silicones, just pure oils so one bottle will last an awfully long time. 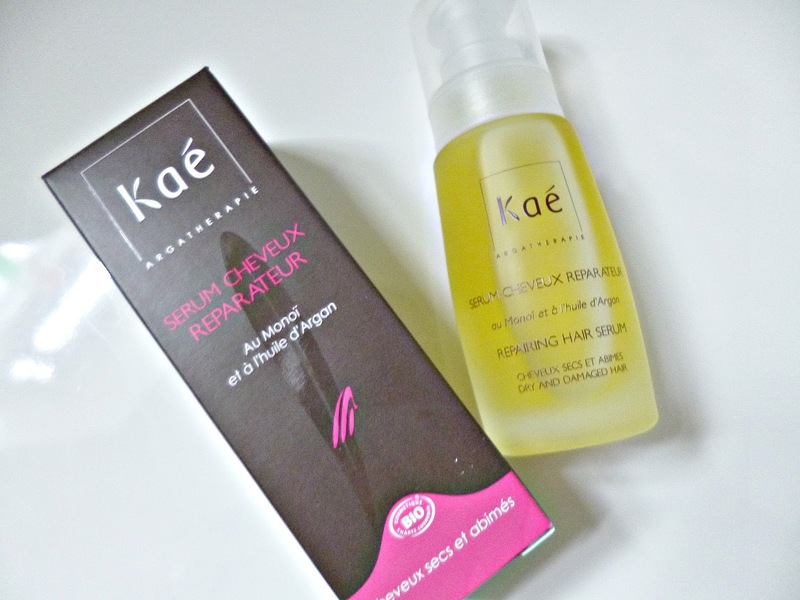 Kae have been a joyful discovery for me, certified organic by Ecocert this French range is extremely luxe and the heavy glass packaging really shows off the ingredients inside. Definitely a brand I would like to explore further. You can find Kae alongside other fabulous natural brands at Ecobeauty shop. Post contains a PR Sample, please see my full disclaimer for details.